May 2, 2016　Vox Populi, a daily column that runs on Page 1 of The Asahi Shimbun. I went to a pro baseball game at Jingu Stadium in Tokyo the other day for the first time in a few years. It turned out to be an exciting slugfest. But what really struck me was the "calm" at home plate. There were no violent base runner-catcher collisions. Under new rules that came into effect this season, runners are now prohibited from slamming into basemen, and catchers are no longer allowed to resort to rough play to block runners at the plate. Similar rules were introduced in Major League Baseball in 2014 after serious injuries resulting from collisions at home plate became a major concern. Even though gutsy, aggressive play is what fans expect at MLB games, players' safety could no longer be ignored. When did base running become "aggressive"? It began with legendary Detroit Tigers outfielder Ty Cobb (1886-1961), who revolutionized base running more than a century ago, according to Takashi Isshiki, 67, a member of the Ehime Prefectural Matsuyama Higashi High School baseball team alumni association. Isshiki is also an expert on the history of baseball rules. Cobb was notorious for tripping infielders on base and aiming his spikes at their hands, feet and legs. 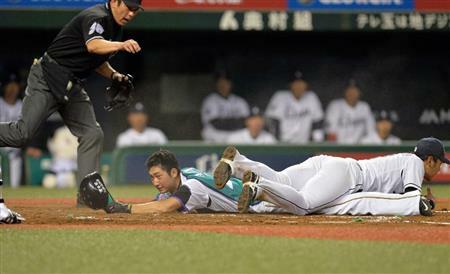 "He often came extremely close to breaking the rules with his base running," Isshiki says. "But the fans loved his aggressive style, and it eventually became the norm for major league ballgames." Isshiki's alumni association researched baseball rules of the Meiji Era (1868-1912) with the aid of an essay by haiku poet Shiki Masaoka (1867-1902), an alumnus of Matsuyama Higashi High School. According to Masaoka, pitchers were allowed only to throw underhand; the batter was out if the ball he hit was caught after one bounce; the strike zone could change according to the batter's prior request; and base stealing was not allowed. Using these rules, Isshiki's association has been playing local amateur teams for the past 14 years. "Games proceed at a nice, leisurely pace," Isshiki says. “There are no dangerous close plays. It surprises you to realize how laid-back a sport baseball really was." Reading Masaoka's essay, you can imagine hearing the cheers of the players that must have filled the ballyards of the Meiji Era. Those were the cheers of simple exultation that were heard at ballparks around the world before dangerously aggressive play became popular.